World TB Day | Live Healthy S.C.
DHEC Public Health is committed to helping communities prevent and stop the spread of TB. 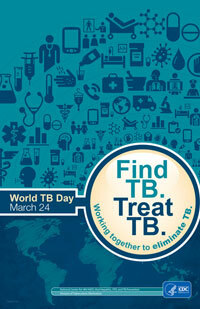 We continue to work to identify additional ways we can help prevent and control TB. For example, in recent months, we adopted a new team-based approach to respond to suspected TB outbreaks at the local level. This best-practice approach allows each one of our operational areas in our four public health regions to have their own dedicated TB nurses, social workers, and support staff. These staff members work as a team to investigate suspected cases of TB disease and coordinate appropriate patient treatment to control the spread of the disease. Currently, we have 59 dedicated TB team members across the state working to help South Carolinians impacted by the disease. One of these staff members in particular, is Amy Rice, our Midlands TB Manager, who is known for routinely going above and beyond the call of duty. Amy works long hours guiding her team in assisting with investigations of suspected TB cases, providing outreach and education about the disease to community partners, and traveling to other regions to assist in investigations whenever needed. Thank you to Amy and all of our TB team members for your hard work and dedication. Your efforts have helped South Carolina realize the lowest level of TB disease in more than a decade. Keep up the great work!